I'm so excited to announce that Glass Actress, my second full-length book of poems, will be out in the world come February! I've been working on putting this dang thing together since 2015 and the poems go back to the mid-2000s. The aughts! So you ought to pre-order it. You can do such a thing by going to the Furniture Press Books website and clicking the shiny "purchase" link. The cover price is $14.99 and it's free shipping until February 7! 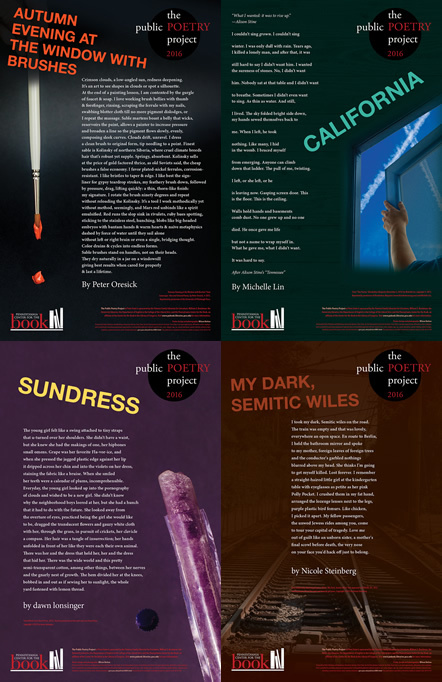 Also, the first 20 orders will receive a signed, beautifully designed poster of my poem "My Dark, Semitic Wiles." This poem is included in Glass Actress and was chosen by the Pennsylvania Center for the Book at Penn State for their 2016 Public Poetry Project poster series. (Click here to see all four 2016 posters—mine is on the bottom right.) So that's not too shabby, in terms of a bonus gift. For those who are interested, I'm in the process of plotting a launch event in Philly, and maybe one in NYC too. I will keep you updated, of course. Two poems in Jellyfish #14, both titled "Fat Dreams"
One poem in Sixth Finch's Winter 2017 issue, "The Old Math"
For those expecting funny poems from me—not so much these days. But I hope you enjoy these new pieces all the same.